Autodesk has released Maya 2018. The latest version makes Viewport 2.0 Maya’s primary viewport display, and adds a few new modelling and animation features. There's also improvements to the Bifröst fluid simulation and MASH motion graphics tool kits. Autodesk has yet to post any videos of the new features, but the online documentation is live. Maya 2018's new visibility mode will show rig controls only when you get near them with your mouse, reducing viewport clutter when working with complex rigs. Other new features include a full transition to Viewport 2.0, with the old legacy default and high quality viewports no longer available in the Maya user interface. 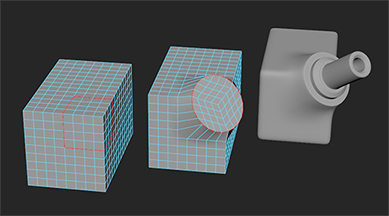 Improvements have also been made to Viewport 2.0, with better displacement previews and support for OpenSubdiv 3.1. In modeling there's a new circularize command, which makes it easier to create circular extrusions that blend with the basemesh. There's also better support for symmetrical modeling, with global symmetry respected across all tools, and a number of improvements to the have been made to the UV Editor. Many of these features were rolled out in Maya 2017 Update 3, so if you're on a subscription you will already have them. In animation the clip-based Time Editor that was introduced in Maya 2017 gets new features. One of them is a new Loop Progressive option for generating complete movement cycles from shorter animation clips. The new version of Arnold that now comes bundled with Maya has been updated to Arnold 5. New features here include the physically accurate surface, hair and volume shaders, light path expressions, and improved sampling. The Bifröst simulator gets the option to cache meshes on a per frame basis, and there's six new attributes for controlling foam generation such as air turbulence parameters and boundary drag. BOSS, Bifröst’s system for simulating ocean surfaces, can also now output foam maps. For MASH, Maya's motion graphics tool kit, there are new primitives including discs, gears and super shapes, which are aimed at creating complex abstract objects. For a full list of what's new in Maya 2018, check out the online documentation.